Having always had a passion for animals, and after volunteering with the WILVOS Sunshine Coast, Samantha wanted to broaden her knowledge and grow her skills in order to care for other peoples pets the same way she would like hers to be cared for. After gaining her certificate at the end of 2014, she worked in a very quiet practice in Brisbane, before jumping in the deep end at AES Tanawha and Noosaville this year. She loves it, as it finally gives her a chance to practically grow her skills and knowledge. 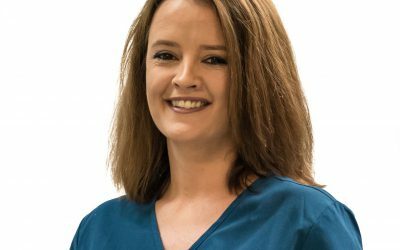 Being a relatively new nurse, she’s constantly learning things she finds amazing, but she’s most passionate simply about treating the patients in her care with the same level of care and respect she would want her own pets to be treated with. The vets and nurses have such an enormous base of knowledge between them and they are always open to sharing that. They look out for their patients, their clients, and the fellow staff they work with. They, along with the client care team, go out of their way to do the best they possibly can under whatever circumstances they are given. It is great to be a member of such an awesome team! Samantha has undertaken short online courses, attended seminars, and continue to grow her knowledge through reading and internet-based learning. She would eventually like to do the Diploma in Emergency and Critical Care. She’s always learning at AES! She previously volunteered with the WILVOS (Wildlife Volunteers QLD), but stopped in order to study nursing. During her studies, Samantha volunteered at the RSPCA (an eye-opening, but wonderful experience). She’s not currently doing any volunteer work. In her free time, she likes to hang out with her gorgeous Kelpie/Cattle “Indy”, and tends to her Cichlid, “Jack”, and her many other smaller fish (of which there are way to many to name). She also LOVES movies, and spending time her family.